In April, Arctic ice extent is declining as usual with the notable exception of Bering Sea, along with ice retreating in nearby Okhotsk. Bering still has some ice to lose, but at 178k km2 it is only 31% of the ice there January 27, the largest Bering extent this year. It is unusual since the Bering ice is only 25% of the 12 year average for this date. Nearby Chukchi Sea is hardly showing any open water, down only 10k km2 from its maximum. Open water is also gaining in Okhotsk, the other Pacific basin, but ice extent there is still 6% above the 12-year average. 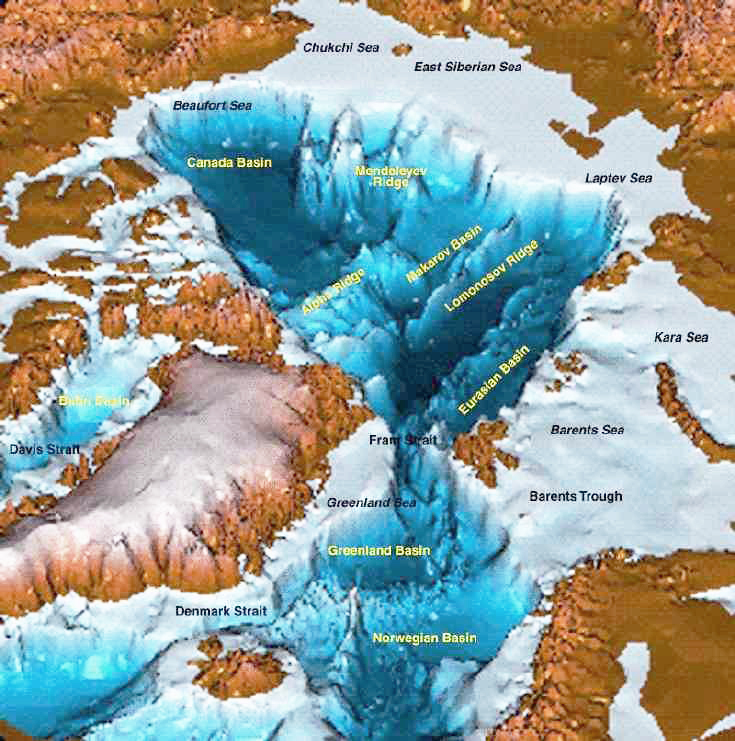 Elsewhere things are mostly typical with Russian and Canadian basins still frozen with high extents. The other two places losing ice are Barents and Baffin Bay/Gulf of St. Lawrence shown below. 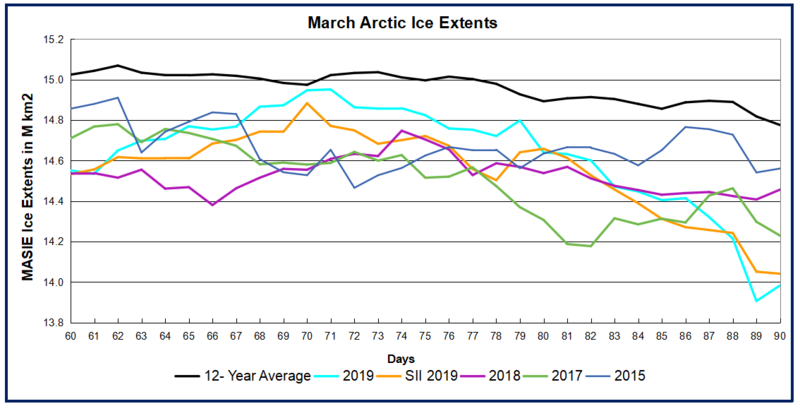 The graph below shows how the Arctic extent has faired since the March maximum compared to the 12 year average with and without the Pacific basins of Bering and Okhotsk. The green line is the 12yr. average without B&O, while 2019 appears in purple when Bering and Okhotsk are excluded. As of day 105, 2019 ice extent is 858k km2 below the 12yr. average, a gap of 6%. 529k km2 of that difference comes from the combined losses in Bering and Okhotsk. The graph below shows March/April 2019 compared to average and some years of interest. All years are tracking below the 12-year average. 2019 MASIE and SII are the same and well below 2018, largely due to Pacific ice losses. 2007 is only slightly higher than 2019 at this point. The table below shows ice extents by regions comparing 2019 with 12-year average (2007 to 2018 inclusive) and 2007. Of course both of these basins will melt out long before the September minimum, along with the Russian shelf seas. As indicated earlier, Bering supplies almost 2/3 of the deficit to average, with Baffin Bay providing most of the other 1/3. Of course both of these basins will melt out long before the September minimum, along with the Russian shelf seas. The monthly average for March represents the annual maximum for Arctic ice extent. The graph shows the 12-year March average in MASIE is 15M km2, with SII about 200k km2 less. In this period six years were higher and seven lower, including a virtual tie between 2019, 2015 and 2007, slightly higher than 2017 and 2018. In either MASIE or SII this March is ~330k km2 or 2% below the 12-year average. As we will see, March 2019 ended with a flash melt that reduced extents dramatically in the final week or so. First the graph of March comparing the daily extents. Note that 2019 was close to average as recently as day 79 before dropping well below average and recent years. As reported previously, most of the decline was due to early melting in Bering Sea, which loses its ice every Spring anyway. Below compares NH ice extents with and without Bering ice. The gap between the black and green lines shows Bering contributed on average ~600k km2 to overall NH ice extents at the beginning of February, increasing to 800k km2 by end of March. In 2019, the gap between the cyan and purple lines shows ~500k km2 of Bering Ice starting in February, decreasing to 140k km2 by March, then increasing up to 450k km2, and now back down to 180k km2. When the Bering volatility is set aside, the purple and green lines show Arctic ice excluding Bering was above average most of the month, and only slightly lower at the end. The cold front is shown in the image, The link underneath goes to the video. The table below shows extents for day 90 comparing 2019 to the 12 year average, and also showing the 600k km2 loss of ice in just 8 days at month end. Note that BCE (Beaufort, Chukchi and East Siberian) is rock solid, along with Laptev. Atlantic melting has begun, with the largest losses in Barents and Baffin Bay. The major deficit in Bering is there, And while Okhotsk has started melting, it remains 235k km2 above average at this time. Two Weeks of Growing Bering Ice: The above image shows the last two weeks of dramatic ice growth in Bering with only minor melting in Okhotsk. Bering Sea on the right more than doubled, adding 250k km2 and effectively sealing off Chukchi inside the Arctic. Meanwhile on the left Okhotsk ice seesawed, ending up 150k km2 lower, but still at 88% of 2019 maximum. The graph below shows March progress in ice extent peaking and beginning the melt season. As noted before, the month started with a sharp increase nearly reaching average and 15M km2. After March 12, ice declined steadily as is normal after mid-March. 2019 extent is running lower than the 12 year average, but slightly higher than other recent years. SII is showing about 100k km2 less ice than MASIE. 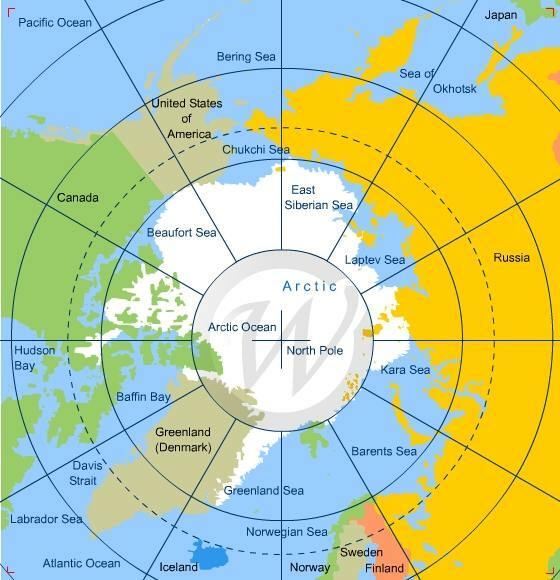 The table below shows the distribution of ice in the various Arctic basins. The table shows how 2019 is 290k km2 or 2% below the 12-year average. Most basins are matching average extent, including Barents Sea edging slightly ahead of average. Greenland Sea and Baffin Bay are below average. 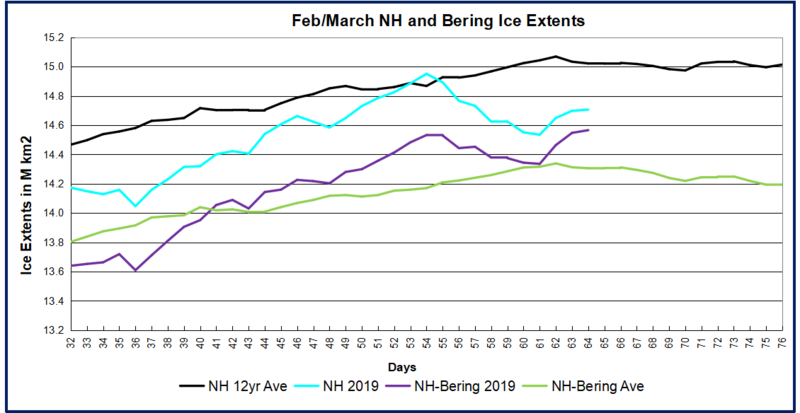 Despite recent gains, Bering ice is 327k km2 in deficit to average, nearly the difference in overall NH extent. Meanwhile Okhotsk is 217k km2 surplus to average, partially offsetting Bering. Above are ice charts from AARI, St. Petersburg for the annual maximum weeks in Mid-March, 2008 to 2019 inclusive. The brown color signifies Old Ice that survived at least one summer’s melt season. The Arctic heart is beating clear and strong. Note differences between diminished years like 2012 and 2013 compared to more robust recent years. For context, note that the average daily maximum has been ~15M, so on average the extent shrinks to 30% of the March daily high before growing back the following winter. 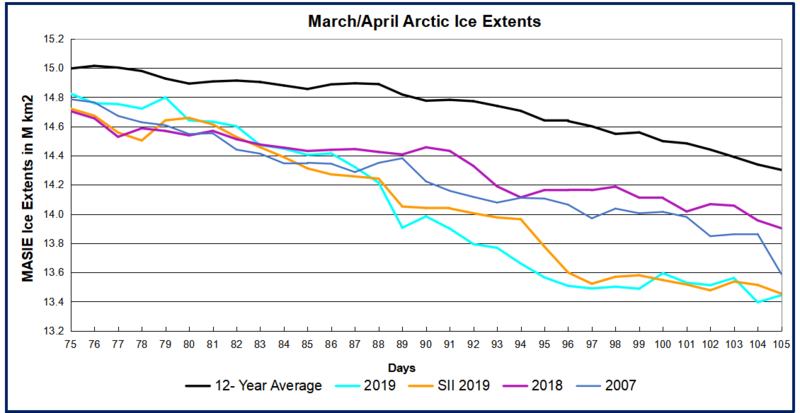 A previous post discussed 15M km2 as the average maximum threshold for March arctic ice extents.The graph shows 2019 exceeded the previous two years, but now it appears to fall just short. On day 61, March 2, 2016 peaked well above 15M, and did not reach that level again. The graph shows 2017 peaked early and then descended into the Spring melt. 2018 started much lower, gained steadily before peaking on day 74, 250k km2 below average. 2019 has been exceptional, surging early to surpass average on day 54, then declined for a week, before re-surging to virtually tie the average extent on day 70. Day 71 extent matched the earlier peak, then retreated and is now unlikely to go higher after day 75. Presently, on day 75 2019 is 1% below the 12 year average (2007 to 2018 inclusive) and slightly higher than the preceding three years. As reported previously, the action is mostly in the Pacific basins. The last 10 days show Bering on the right recovering from its minimum to add back 230k km2. Meanwhile Okhotsk on the left lost 120k km2, so the combined gain was not enough for NH to reach the threshold. On the Atlantic side, ice extents held firm, with Barents higher than in recent years. Note on the left the ice has pushed well south of Newfoundland. On the right Barents ice is holding onto Svalbard, and Kara remains at its maximum. The table below shows the distribution of ice over the various Arctic basins compared to average and to last year. The table shows that except for Bering, Arctic ice extents are firm almost everywhere. Barents, Kara and Okhotsk are well above average, but not enough to offset the deficit of Bering ice, even with the recent recovery. 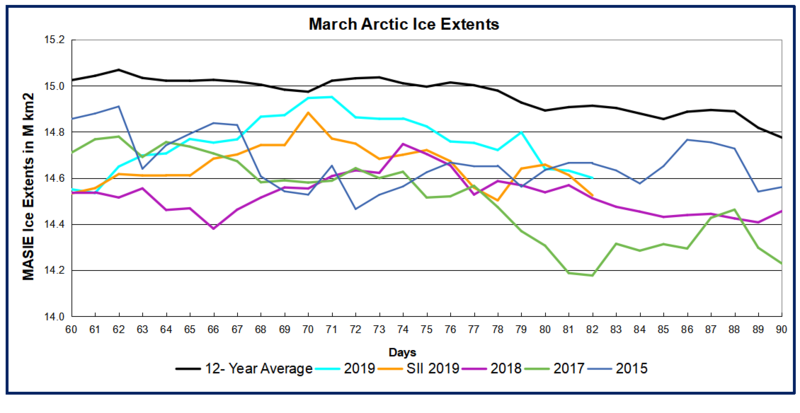 Typically, Arctic ice extent loses 67 to 70% of the March maximum by mid September, before recovering the ice in building toward the next March. For ice extent in the Arctic, the bar is set at 15M km2. The average in the last 12 years occurs on day 62 at 15.07M before descending. Most years are able to clear 15M, but in the five previous years only 2014 and 2016 ice extents cleared the bar at 15M km2; the others came up short. On day 61, March 2, 2016 peaked well above 15M, and did not reach that level again. The graph shows 2017 peaked early and then descended into the Spring melt. 2018 started much lower, gained steadily before peaking on day 74, 250k km2 below average. 2019 has been exceptional, surging early to surpass average on day 54, then declined for a week, before re-surging to virtually tie the average extent on day 70. One final push in the next few days could go over the top. As reported previously, Bering Sea is a big part of the story this year. 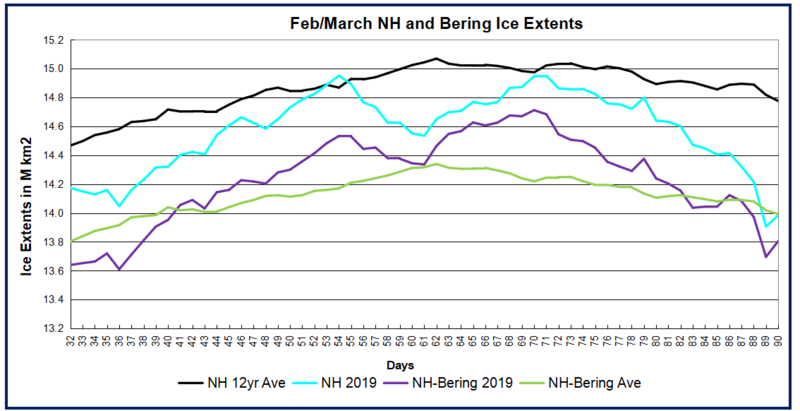 The graph above shows NH ice extents from mid-February to mid-March with and without Bering ice. The gap between black and green lines shows that Bering contributed about 700k km2 to the NH average, increasing to 800k km2 by the end of this period. However, 2019 started with about 500k km2 from Bering. The gap between the cyan and purple lines shows Bering ice declined down to 140k km2, before adding back 100k km2 in the last 3 days. Meanwhile, Okhotsk Sea next door gained steadily and is now holding above average ice extents. Except for Bering, 2019 ice extents are well above the 12 year average (2007 to 2018 inclusive). What will the ice do this year? 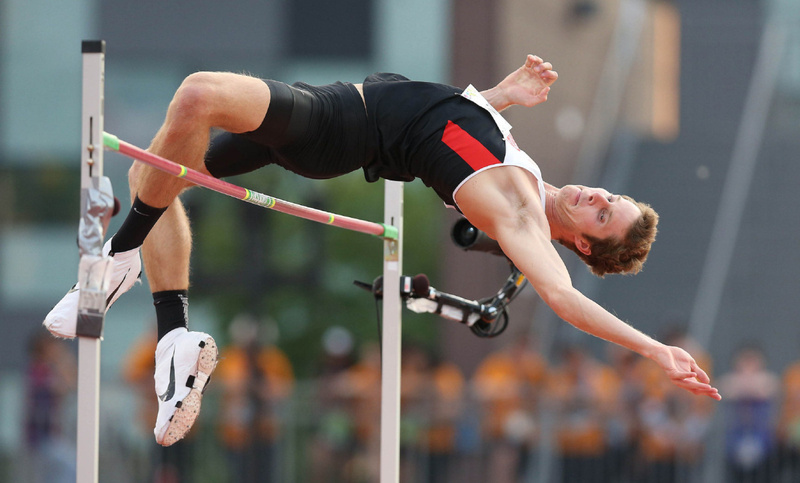 Where will 2019 rank in the annual Arctic Ice High Jump competition? 2019/03/06 GCOM-W/AMSR2 [Okhotsk] Sea Ice Concentration Source: JAXA. Note Hokkaido Island, Japan, under the white triangle tip. This week has news reports frightened about the early melting of ice in Bering Sea. This post is to reassure everyone that the lost ice has been found, most of it just next door in Okhotsk sea. The Pacific basins of Bering and Okhotsk display opposing ice patterns this year. The last two weeks saw open water growing on the right in Bering Sea, now down to 140k km2, one-fourth of its maximum extent. Meanwhile, Okhotsk on the left grew steadily, now pressing down on Hokkaido Island, producing the southernmost Arctic Ice to be found. The graph below shows how 2019 compares to the 12 year average, after taking the Bering anomaly out of the picture. 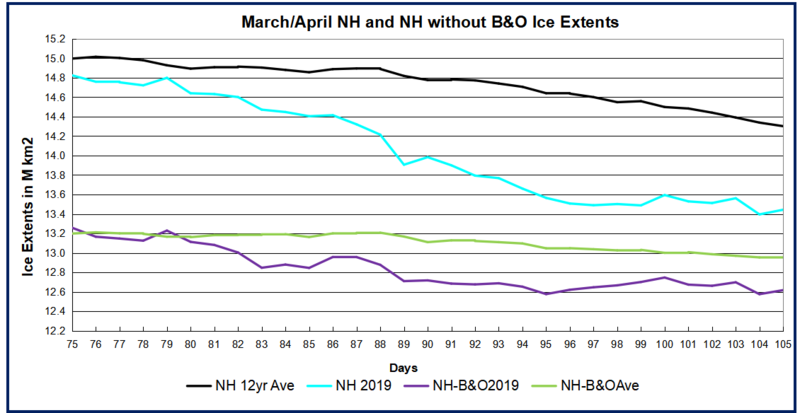 The chart runs from mid-February to mid-March, showing how 2019 NH ice extent peaked above average on day 54, declined for a week, then rose again recently. The effect of Bering ice loss appears in the gaps between NH extents with and without Bering ice. Note that the black and green lines show Bering has contributed about 700k km2 to the overall total, and that increases to 800k km2 by day 76. 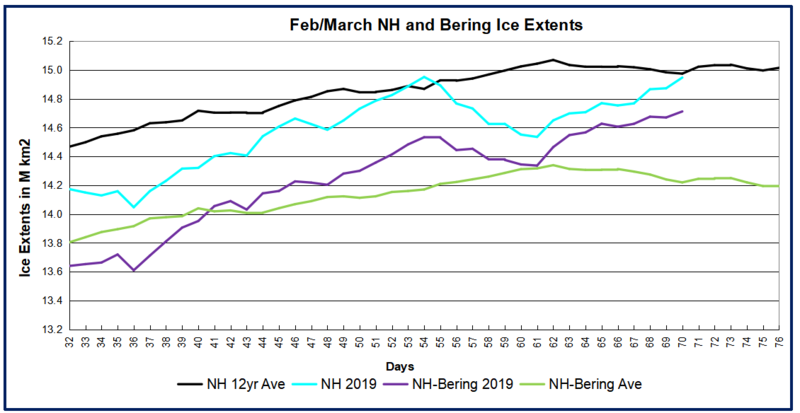 2019 NH included about 500k km2 from Bering on day 32, but the Bering extent has steadily decreased, now only 140k km2. Thus 2019 w/o Bering is 270k km2 greater than NH average w/o Bering at this time, with another 10 days or so for additional ice to form. The table below shows ice extents in the various basins on day 64. The Bering deficit is 575k km2 or just 20% of the 12 year average. Surpluses in Okhotsk, Baffin, Central Arctic and Barents do not completely offset, so the NH total is 315k km2 or 2% below average. Taking a boat trip from Hokkaido Island to see Okhotsk drift ice is a big tourist attraction, as seen in the short video below. Al Gore had them worried back then, but not now. 10 Days in Pacific Arctic: The above image shows the pacific ice seesaw returning at the end of February. Bering Sea on the right was at 95% of 2018 maximum and then lost 180k km2 in ten days, now at 65 % of max. 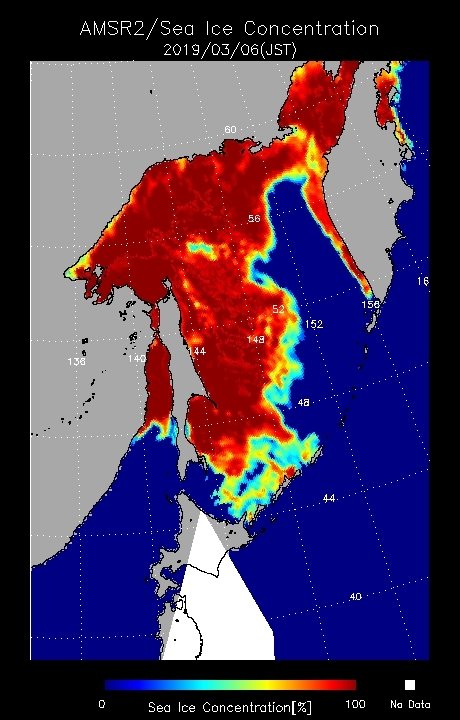 Meanwhile on the left Okhotsk Sea gained 70k km2, and is now 106% of 2018 maximum. The graph below shows February progress in ice extent recovery. As noted before, the month started with a slight decline, then ice grew rapidly for 18 days peaking on day 54 above the 12 yr. average, and above the previous two years. Then ice retreated the last five days with the February monthly average ending 240k km2 or 2% below average. SII lags MASIE by ~100k km2 for the month. 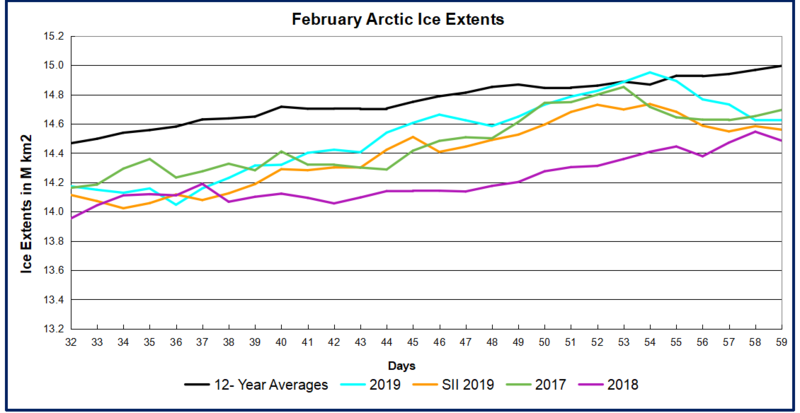 The next two weeks will show whether 2019 is maxed out, or whether the ice extent catches up to the average which flatlines over that period. The table shows how 2019 is matching the 12-year average almost everywhere. Barents Sea has caught up and edged ahead of average, and much higher than last year. Greenland Sea is below average but higher than 2018. The overall deficit is due to Bering ice down 460k km2 to average, only partially offset by a surplus of 193k km2 in Okhotsk. Footnote: At his AER blog Arctic Oscillation and Polar Vortex Analysis and Forecasts Dr. Judah Cohen writes on Feb. 25 regarding this cold winter in the Arctic. Excerpts in italics with my bolds. As I have written many times in the blog this fall and winter season the influence of a significant stratospheric PV disruption typically lasts on the order of four to eight weeks. It certainly looks like the PV split from early January has gone the distance and has persisted for a full eight weeks or possibly even a little longer. Based on the latest polar cap geopotential heights (PCHs) forecast the whole event is winding down over the next week or so. Therefore, I think that we can start to draft the obituary for this event. The stratosphere-troposphere coupling differed from last year’s PV split and other previous similar events but certainly not all. Though the “dripping” of warm PCHs occurred periodically, there were long gaps between “drips” where the tropospheric PCHs even turned cold for an appreciable period. Also, the AO and NAO never turned strongly negative nor was there any persistent period where both indices remained in negative territory. This is in strong contrast to last winter. As I wrote in last week’s blog, I think at least part of the reason might be the relatively cold central Arctic this winter compared with the last several winters where the Arctic was near or at record warm. Though despite what could be considered atypical or less traditional stratosphere-troposphere coupling following the stratospheric PV split, I would argue there were still some impressive impacts on the weather. Maybe those impacts were more discernable and more impressive across North America than Eurasia, but both continents had record cold and snow. So, what to expect as the stratosphere-troposphere coupling event wraps up. For Europe, temperatures are already mild and with the AO predicted to remain positive and could potentially turn even more strongly positive if the cold PCHs couple all the way to the surface, it is hard for me to see a return to any kind of prolonged cold this month. Across North America it is more complicated. 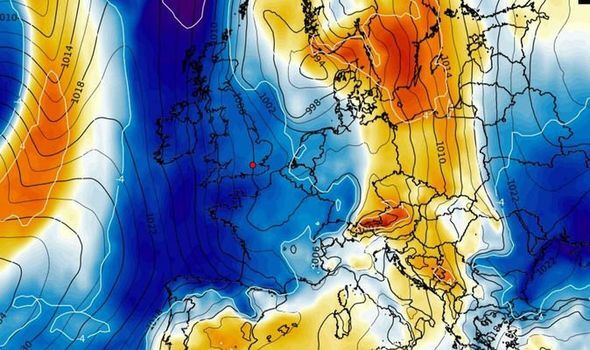 Cold temperatures are predicted to be expansive across the continent and even record cold is possible over the next week or so. In addition, snow cover is relatively extensive and, in many locations, unusually deep especially on either side of the US-Canadian border. I don’t expect the cold air across in North America to simply disappear anytime soon, but if the if the cold PCHs couple all the way to the surface, this would favor the cold temperatures being mostly confined to western North America. I also feel that circulation and temperature anomalies in the stratosphere suggest a relatively cold western North America and relatively mild eastern North America especially Eastern US. And despite the cold start to March in the Eastern US the models are predicting a return to mild conditions by the middle of March. ice Charts from AARI showing ice extents by duration. Appearing in brown is Multi-year ice (surviving at least one melt season). Agencies like DMI produce model-driven estimates of Arctic sea ice thickness. I limit my analysis to extents because they are observation-driven. “Today, the sea-ice concentration is in general well estimated using satellite products, while the sea-ice thickness is poorly known. 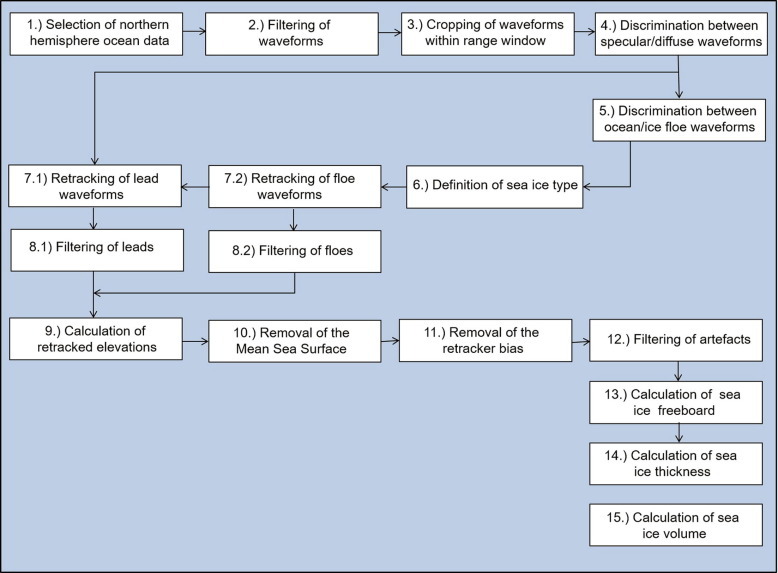 The model gives a realistic estimate of the total amount of sea-ice within the Arctic.” (concentration means extent). FWIW, DMI estimates of Arctic thickness have increased over the last decade. It’s a complicated business to get remote signals of thickness, which varies with drifting and compaction from storms and currents. Another way to get at the issue appears in the animation above with AARI ice charts. They are derived from satellite imagery, configured so that the brown color represents multi-year ice that survived at least one melt season. The animation shows the last 11 years had some low years, especially 2008, 2009 and 2013, with higher years since. And obviously the locations of older ice are variable. 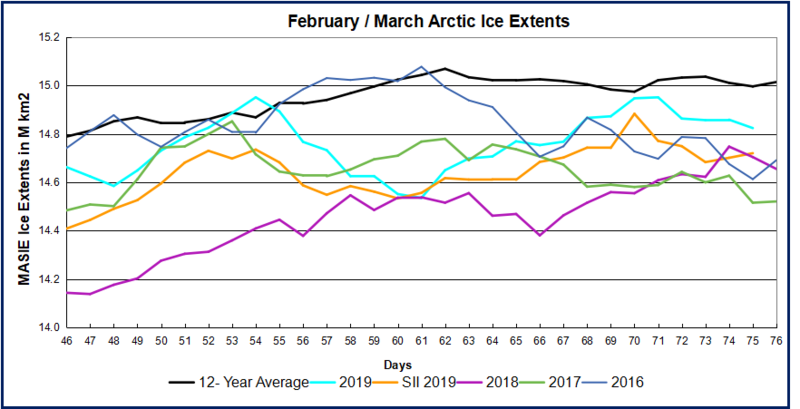 The graph below shows February progress in ice extent recovery. 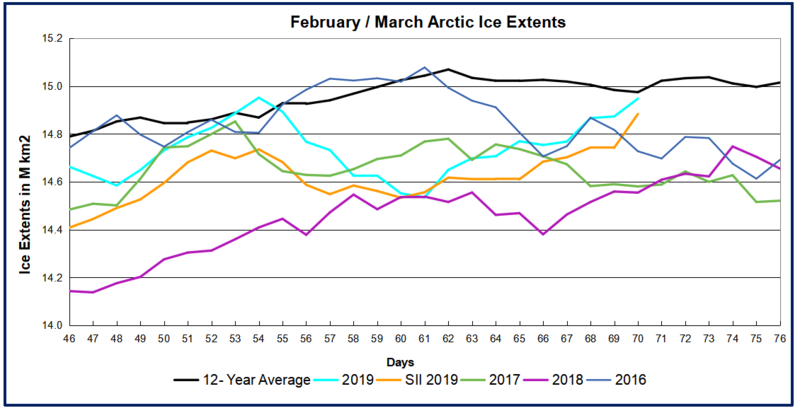 2019 ice extents declined slightly to start the month, then grew rapidly in the last two weeks to nearly match the 12-year average (2007 to 2018 inclusive). SII lags MASIE by 100k km2 at this date. 2019 is presently matching 2017, and has nearly 500k km2 more ice than 2018. Interestingly, 2019 extent has already surpassed 14.75 M km2, the 2018 maximum reached on day 74. Note in the graph that 2017 peaks on day 53, the maximum extent that year. The average maximum is 15.07 M km2 on day 62, so 2019 has 11 days more to reach that level. The table shows how 2019 is matching the 12-year average almost everywhere. Barents has edged 13% ahead of average, and is much higher than last year. The slight overall deficit is mainly due to Bering ice down nearly 300k km2 to average, only partly offset by the surplus in Okhotsk and Central Arctic. 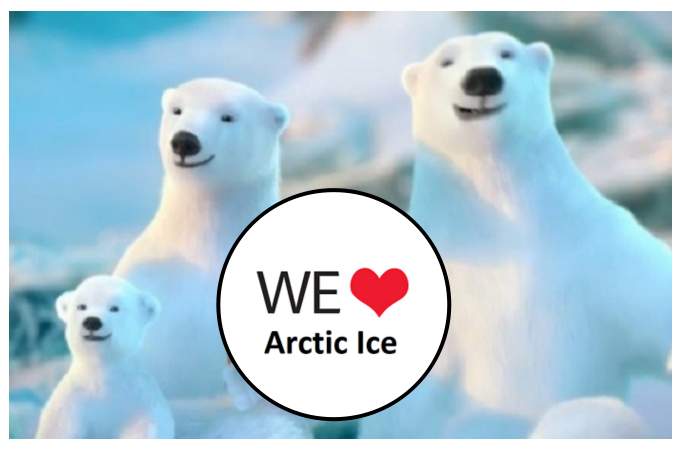 Footnote: At his AER blog Arctic Oscillation and Polar Vortex Analysis and Forecasts Dr. Judah Cohen writes on February 18 regarding this cold winter in the Arctic and NH. Excerpts in italics with my bolds. Figure ii. Analysis of surface temperature anomalies ffrom 18 November 2018 until 15 February 2019. Taken from https://www.esrl.noaa.gov/psd/map/clim/glbcir_rnl.shtml. This winter once again we had what I would refer to as a highly anomalous stratospheric PV split but not as extreme as 2009 and the temperature anomalies for the winter, or certainly post the PV split are probably not going to look that terribly different from 2009. The largest negative departures are likely to be in western North America and Siberia. I will show the winter temperature anomalies with the AER forecast posted in November and from the dynamical models but for today’s blog a quick and dirty surface temperature plot from NOAA will do (Figure ii). The most striking temperature anomalies are what I would consider as a couplet – strong positive temperature anomalies in the Barents-Kara Seas and strong negative temperature anomalies in Siberia. This temperature couplet has been the most consistent feature of Northern Hemisphere winters of probably the past 15-20 years. This gets to the heart of the debate does Arctic change influence mid-latitude weather. I think I have been as emphatic as anybody on the planet that the answer is yes, and this winter will only strengthen my conviction. The other continental region that is likely to have negative departures is Canada and since the PV spit the largest negative departures are centered in Western Canada. Since November, I have consistently stated that the largest sea ice anomalies and consequently the largest positive atmospheric temperature anomalies will be in the Barents-Kara Seas. I have also discussed how surprising I find it how cold the remainder of the Arctic has been this winter. As an example, I show in Figure iii the global temperature anomalies from yesterday February 17th the https://climatereanalyzer.org/. The Arctic positive temperature departure is 0.9°C equal to the NH and global temperature departure. This is a far cry from recent winters when the Arctic has warmed at a rate six times the rate of the remainder of the globe. Ironically the globe is currently experiencing Antarctic amplification and not Arctic amplification contrary to expectations. My thoughts about March haven’t changed much since last week. The stratosphere has worked well as a predictor of North American temperature anomalies and for the most part they seem to support a continuation of cold temperatures focused in western North America. Despite this it is my own experience that cold air focused in western North America tends to shift east with time especially in the late winter. Therefore, based on this empirical observation I was expecting possibly a return to more sustained cold in the eastern US as winter winds down. This is now being predicted by both the GFS and ECMWF models. It is my experience that models may be too quick to predict a pattern change but they are often correct in anticipating the pattern change. But even assuming the eastern US turns colder, will it persist for more than just a few days? My confidence in such an outcome would increase if the Arctic finally warms something that has not really happened so far this winter.